I did my best! 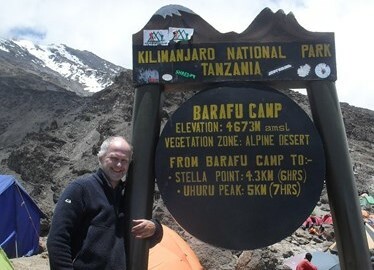 Made it to Barafu camp (base for summit attempt) 15,239 ft above sea level, then at midnight I lead our group of ten up towards the top. After an hour or so, I started feeling nauseous with a bad headache coming on. Added to this I felt immensely fatigued & every step took my breath away. My throat was as dry as wombat’s poo & I had to stop to take on water. Not good when everyone else is following so closely in convoy, so the lead guide made me fall back to be supported by Elya (my allocated personal guide). After half an hour the others were way ahead & I felt even worse & had to keep stopping. Gilman’s point, a milestone to the summit was still some way off & I came to the realisation that even if I continued up, I might not make it back. Within 5 minutes of descent I was violently sick, I just wanted to lie down & go to sleep (Temp -10 DegCent). I felt delirious & if it hadn’t have been for Elya I am convinced I would have perished on that damned mountain. Unfortunately the descent has taken it’s toll too & I’m now walking with a stick due to a badly bruised big toe! Climbing Kilimanjaro proved much more of a challenge than I’d ever imagined. My team mates all made it to the top, & they all agreed it was the toughest thing they’d ever done in their lives. My roommate said reaching the summit was an anti-climax because this 22 times half marathon runner felt too exhausted to appreciate the moment. I know I made the correct decision to turn back but I’m glad I made the effort & who knows maybe someday I’ll give it another go? !